The prosperity of the 1920s facilitated new programs and modern equipment at Camp Workcoeman. The breadth of the economic crisis of 1929 was not immediately apparent to the Scouters of the Northern Litchfield County Council. However, in 1930 the campaign to raise money to grade the camp road and drill a well fell flat. In addition to the problems funding camp projects, the annual council fund drive came up short, by nearly a quarter of the goal. The 1931 fund drive was more ambitious, seeking to make up for the previous year’s loss with a higher goal. While the 1931 drive raised an additional four hundred and sixty-nine dollars, percentage-wise the fundraiser was even less successful. These difficulties were endemic of the 1930s; the troubles of raising money exposed deflation. In deflation, the amount of money available for transactions drops, and because of the slow rate at which the economy can adjust to the smaller money supply, deflation strangles the economy. For the Scouts in Connecticut, this meant it was very difficult to get together the funds for a week of camp. As long as deflation rode on the economy, the Council would find it difficult to fund its programs and expand Camp Workcoeman. In 1930, the large-scale unemployment that characterized the Great Depression was not yet widespread, hovering around 5.4%. But in 1931, as the depression worsened and businesses closed, the unemployed rate rose. Torrington’s corporate leaders, who were some of the most active Scouters, spent much more of their time trying to keep their businesses afloat. For example, in March, F. Earle Coe resigned as Council Commissioner to devote his time to keeping the Warrenton Woolen Mill out of bankruptcy. In spite of these monetary problems, the Northern Litchfield County Council continued to grow and in May of 1931 reached a record number of five hundred Scouts and one hundred and seventy Scouters. This new registration height was mostly thanks to three new units, Troop 22 in Canaan, Troop 23 in West Torrington, and Troop 24 in Sharon. The larger council enrollment helped to maintain Camp Workcoeman’s 1931 attendance at 1920s levels. For the Scouts in camp, the program showed no signs of the ongoing business depression. Archery, introduced the previous year, was quite popular, and thanks to a donation from Jennie Coe, the archery inventory doubled. Other citizens still wanted to support the camp program, but because of the deflation, many of the gifts were in kind. For example, Arthur Weigold of the Torrington Creamery donated ice cream served at dinner on Sundays. The camp week culminated on Saturday afternoons, when the boys participated in a Water Meet, while many visitors and parents looked on. The Scouts competed in the breast stroke, back stroke, and diving. For the final event in the Water Meet, the staff hid a watermelon along the shore of West Hill Pond, and the boys sought it out. The winning Scout shared the melon with his tent mates at the evening hot dog roast, which wrapped up the week’s program. 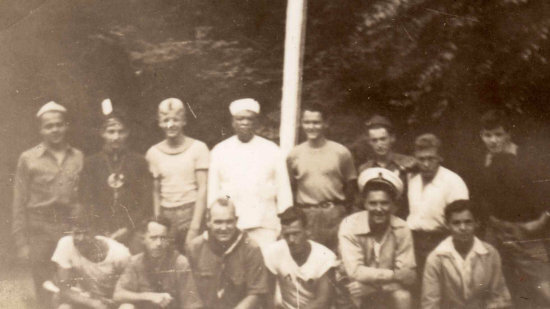 The image below shows the staff in front of the camp’s flagpole, during the early 1930s, likely in 1931. Standing fourth from the left in the top row is Chef Carter Bell; many early campers noted his cooking as the high point of Workcoeman. In the bottom row, Seymour Weeks is kneeling second from the left, Edward Jacot third from the left, and V. M. Koonz may be fifth from the left.